Why Do Jews Celebrate Hanukkah? Ariel Feldman is the Rosalyn and Manny Rosenthal Associate Professor of Jewish Studies and Director of the Jewish Studies Program at Texas Christian University in Fort Worth. When asked which Jewish holidays they know, my students frequently name Hanukkah first. Indeed, it is probably the most public Jewish holiday in the U.S. Not only does it often coincide with Christmas, but there are also giant menorahs, delicious foods, and, of course, presents. But despite the ideal conditions for a great holiday — gifts, cuisine, and the right timing—this popular holiday had a rather slow start. The eight-day long festival of Hanukkah, “dedication” in Hebrew, celebrates the purification of the Temple in Jerusalem. The events that led to it are among the greatest puzzles of ancient Jewish history. At that time, Judea was a part of the vast Seleucid kingdom ruled by Antiochus IV. His predecessors had no problem tolerating the diverse religious beliefs of their subjects. Yet in 167 BCE Antiochus banned Judaism and converted the Jerusalem Temple into a pagan shrine. To explain the king’s unprecedented actions, some scholars argue that he wished to unify his empire under one religion. Others suggest that Antiochus acted on the advice of the Jewish elites. These Jews embraced the Hellenistic culture and believed that a strict observance of their ancestral religion led to a dangerous isolation from the rest of the world. According to yet another view, the king’s forceful prohibition of Judaism was a punishment for a Jewish uprising fueled by their separatist religious worldview. One of the reasons for the lack of a clear-cut explanation of Antiochus’s policy is the scarcity of sources. Most of what we know about his decree, its implementation, and the subsequent Jewish revolt culminating in the first Hanukkah comes from two texts, the First and Second Books of Maccabees. Given the current popularity of this festival, it is surprising that neither of these Jewish books found its way into the Jewish Bible. Rather, we owe their preservation to Christian copyists. Of course, Jewish traditional lore also has stories about Hanukkah. Yet these are relatively few and late. Curiously, among these late traditions is the one that most Jews are best familiar with—the story of the magical oil vessel known as the cruse. Found undefiled in the desecrated Temple, a jar with a mere day’s supply of sacred oil for the Temple candelabrum miraculously lasted for the eight days of purification. This celebrated miracle pales in comparison to the remarkable victories of the rebels led by Judas Maccabeus. However, since the action-packed accounts of the apocryphal Books of Maccabees were less known among later Jews, the miracle of the cruse, found in the authoritative Babylonian Talmud, became the hallmark of the divine presence in the Hanukkah story. The rededication of the Temple was undoubtedly an occasion for a celebration. However, there is a big difference between a one-time festival and an annual one. The Second Book of Maccabees opens with two letters by Jerusalem officials calling for Jews in Judea and Egypt to celebrate Hanukkah. The second letter is a masterfully constructed argument in support of the legitimacy of the new holiday. Pointing, among other things, to the eight-day long dedication of the First Temple by King Solomon, it concludes with a plea: “Please, celebrate the days.” It seems that not everyone was eager to add another festival to what was already a busy Jewish calendar. Hanukkah’s slow start is not the only curious aspect of this festival. 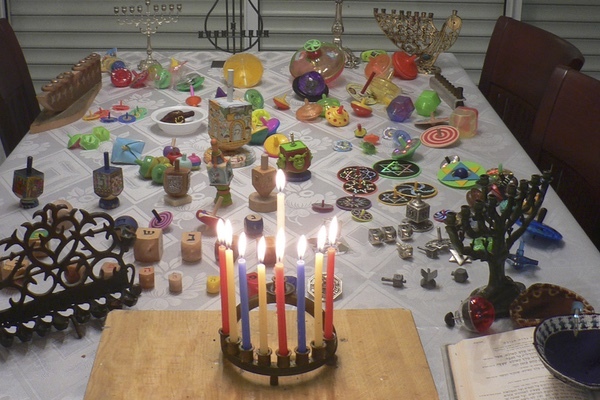 Some of its most cherished features have little to do with the first Hanukkah. The beloved potato pancakes, latkes, seem to have emerged as a Hanukkah dish among the poverty-stricken Jews of Eastern Europe only in the 19th century. The famous dreidel (spin top), a game embraced by many cultures throughout the ages, may have risen to prominence in Jewish communities living in the German-speaking countries. The four Hebrew letters traditionally inscribed on a dreidel correspond to the first letters of the words “nothing,” “all,” “half,” and “put in” found on a German spin top. Finally, the donuts filled with jam (sufganiyot in Hebrew), originally a German dessert, became a part of Hanukkah festivities in Palestine as late as the early 20th century. Still, who would want a Hanukkah packed with all these historical facts, but without latkes, sufganiyot, and dreidel? Not even this professor of Jewish history.